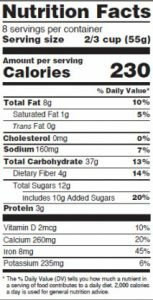 New Nutrition Facts label; What’s different and why? 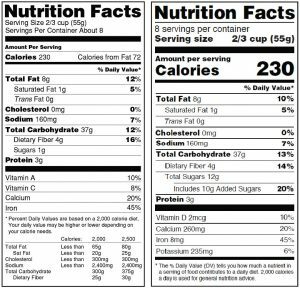 In an attempt to help consumers better understand the nutritional value of what they are buying and later eating, the FDA is proposing a few adjustments to the Nutrition Facts label. On March 3, 2014, the FDA proposed a new rule that would improve the nutrition label as a tool to help consumers make better, more informed food choices and maintain healthy lifestyles. As a result, these adjustments are meant to bring more attention to the information consumers generally seek (calories and serving size), avert their attention to other important nutrients and explain Percent Daily Value in more comprehensible terms. While the adjustments are distinct, the overall effect does not change the iconic label too much. Below is a list of the changes and short reasons why the changes have been made. For more in-depth information about all the changes and their reasonings visit www.fda.gov/food/guidanceregulation/. Vitamin A and C will no longer be required. Current data indicate that Vitamin A and C deficiencies in the general population are not common. These vitamins still would be allowed to be declared on labels on a voluntary basis. Vitamin D and potassium will be added to the Nutrition Facts label. Vitamin D is important for its role in bone health, and some population groups are not getting enough of it. Adequate potassium intake is beneficial in lowering blood pressure and intakes of this nutrient are low among some population groups. The “calories and serving size per container” type size will be increased and bolded. Many consumers use this information in assessing the nutritional value of the product before buying. The FDA hopes the changes will bring more emphasis to parts of the label that are important in addressing current public health concerns such as obesity, diabetes and cardiovascular disease. The information on Percent Daily Value will be shifted to the left of the label. In order to convey the importance of the Percent Daily Value, the shift to the left places the nutrient amounts of the food first and foremost. The intent is to help consumers learn that the Percent Daily Value tells you how much of certain nutrients you are getting from a particular food in the context of a total daily diet. The actual amount of mandatory vitamins and minerals,and those volunteered will be declared. Reason not specified. Total Carbohydrate will be replaced by “Total Carbs." Reason not specified. “Added Sugars” will be listed directly beneath “Sugars.” The proposed rule would require declaration of “Added Sugars” as well, indented under “Sugars,” to help consumers understand how much sugar is naturally occurring and how much has been added to the product. This proposed change is based on expert recommendations –including those from the 2010 Dietary Guidelines for Americans, that Americans should reduce their intake of calories from added sugars. Serving size information will be right-justified. Reason not specified. “Amount per Serving” will change to “Amount per ___” The blank will be filled in with the serving size in common household measurements (e.g. Amount per ¼ cup). Serving Size references will be updated. New serving sizes will reflect how much food people actually consume today in order to give consumers more accurate information regarding the caloric content in the product. Rather than be diminished, by law, serving sizes must be based on how much food people actually consume and not on what they should eat. For some food manufactures, the serving sizes on their product may potentially increase or decrease as new studies have shown 17 percent of the reference amounts customarily consumed used to calculate serving sizes should be changed. The footnote will be replaced with new information. The new information will better explain the Percent Daily Value. To demonstrate the effects of the proposed changes, Figure 1 provides a side-by-side comparison of the current Nutrition Facts label and the proposed label. Figure 2. Proposed multi-serving Nutrition Facts label. Should the proposed changes be accepted for all packaged food, including imports, manufacturers will need to comply with these new regulations within two years after the effective date. Foods exempt from the updated label are those regulated by the U.S. Department of Agriculture’s Food Safety and Inspection Service (i.e. certain meat, poultry and egg products). For more information visit www.fda.gov/food/guidanceregulation/. Food & Drug Administration. 2015. 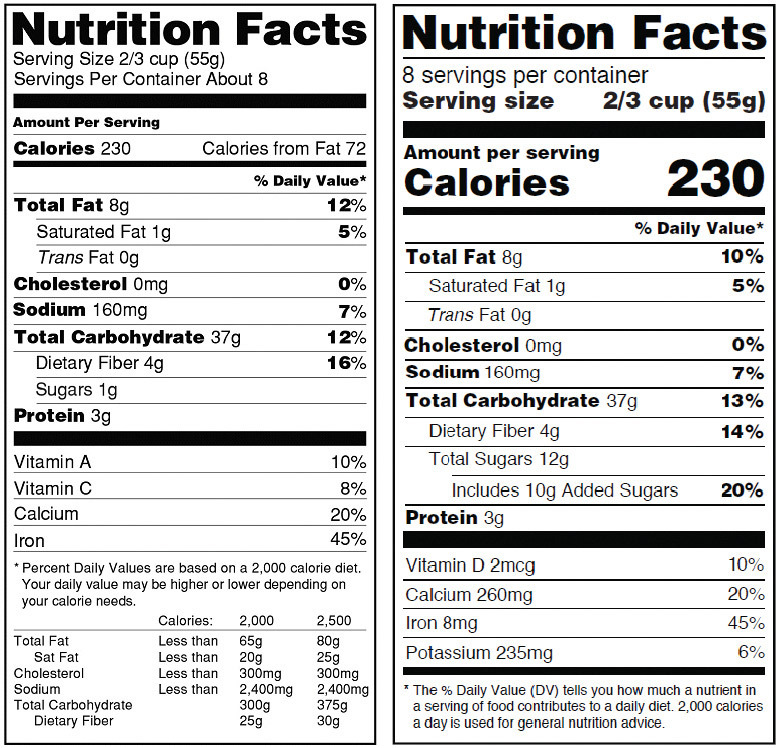 “Proposed Changes to the Nutrition Facts Label.” Available online at http://www.fda.gov/food/guidanceregulation/guidancedocumentsregulatoryinformation/labelingnutrition/ucm385663.htm#QA Accessed July 2014. Food & Drug Administration. 2015. “Proposed Changes to the Nutrition Facts Label.” Available online at www.fda.gov/downloads/Food/GuidanceRegulation/GuidanceDocumentsRegulatoryInformation/LabelingNutrition/UCM387440.jpg Accessed July 2014. Food & Drug Administration. 2014. “FDA Proposes Updates to Nutrition Facts Label on Food Packages.” Available online at http://www.fda.gov/Food/NewsEvents/ConstituentUpdates/ucm385666.htm Accessed July 2014. Food & Drug Administration. 2014. “Food Serving Size Getting a Reality Check.” Available online at http://www.fda.gov/ForConsumers/ConsumerUpdates/ucm386203.htm Accessed July 2014. Food & Drug Administration. 2014. “FDA News Release: FDA proposes updates to Nutrition Facts label on food packages.” Available online at http://www.fda.gov/newsevents/newsroom/pressannouncements/ucm387418.htm Accessed July 2014.